this is a project just finished from an applique class taught by my DD....she does beautiful work and we had a show/tell at quilt guild this week from all her students. thought you would enjoy seeing my project. That is beautiful! I love doing applique! Lovely! Nice job. I am really liking applique right now. That is awsome!! Thanks for sharing. This is just lovely. And so wonderful to be taught by your DD! Really like that. I enjoy doing applique - and most baby quilts I do has some applique. I have 2 bom applique quilts started. Now I'm inspired to get them finished.! I must do more applique. Inspiring work. Well done you and your DD. 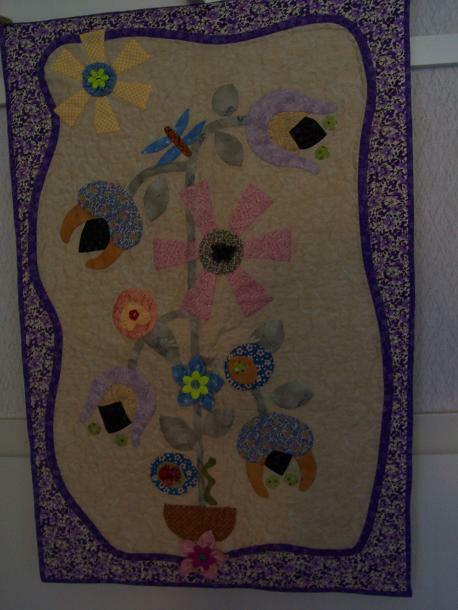 very nice quilt. The applique looks very nice.